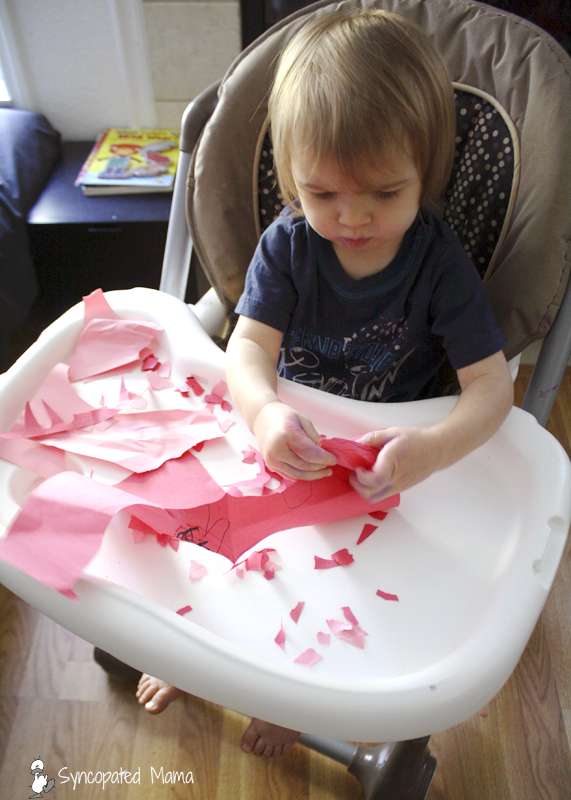 Another holiday means another round of crafting fun with Gv. 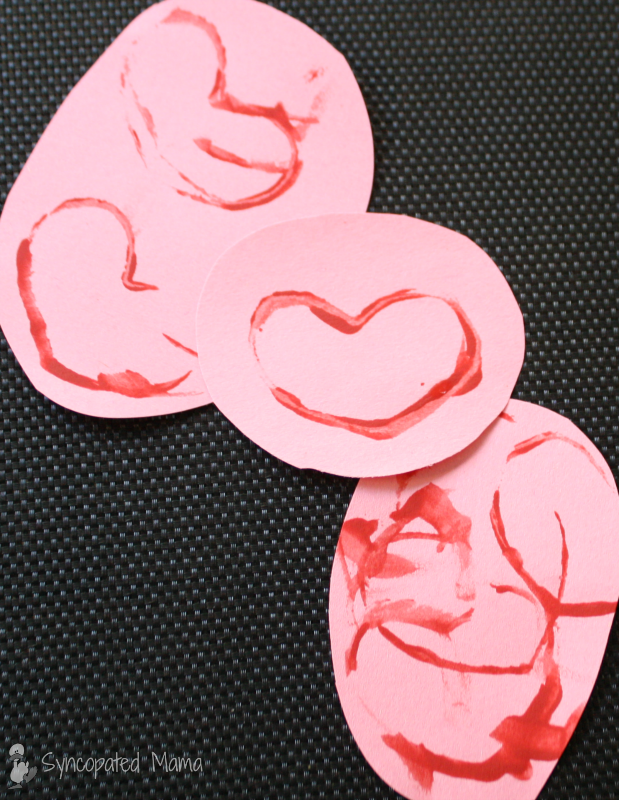 We made decorations for Christmas, Thanksgiving, and Halloween; now we're getting our creative (and messy) juices flowing for Valentine's Day. 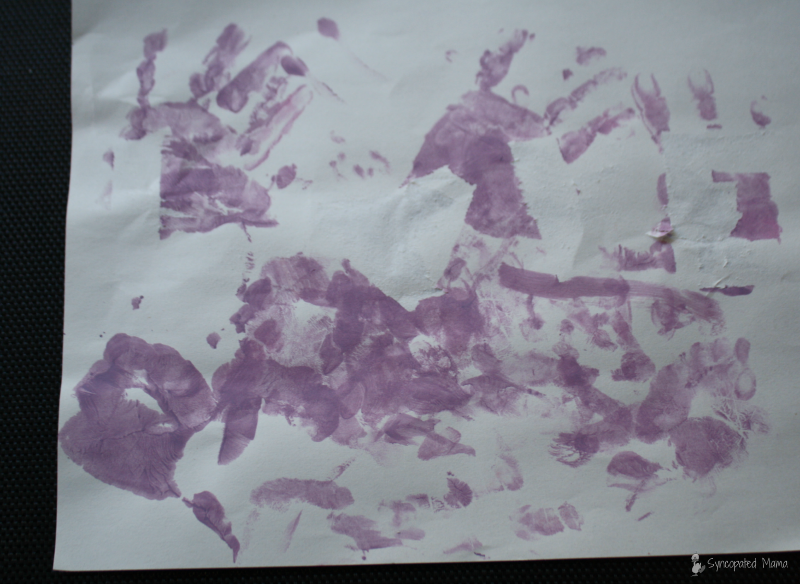 Although I've loved creating all kinds of hand and footprint art with Gv these last few months (give the girl a writing implement and she immediately starts tracing appendages! ), I wanted to try and branch out a bit and try something different. 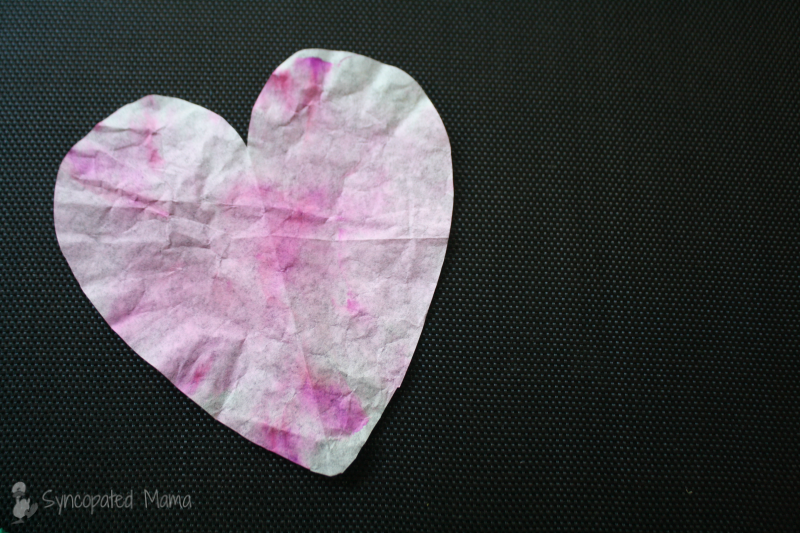 We went with the obvious and turned everything we could into a heart. 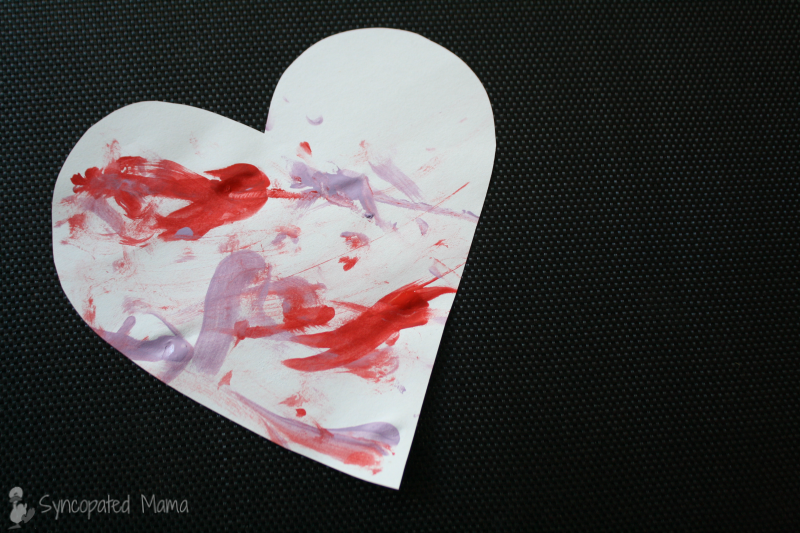 Turns out, pretty much anything you do (see failed projects below) end up looking pretty cute when transformed into a heart! Biggest chance of mess with this project: stickers in the hair or on the body, but just look at that smile! One of the best parts of this project is that your child gets to control where the stickers go. I was right, wasn't I? It's so easy, but turns out really cute! Gv and I worked on all these Valentine's creations over three separate days. 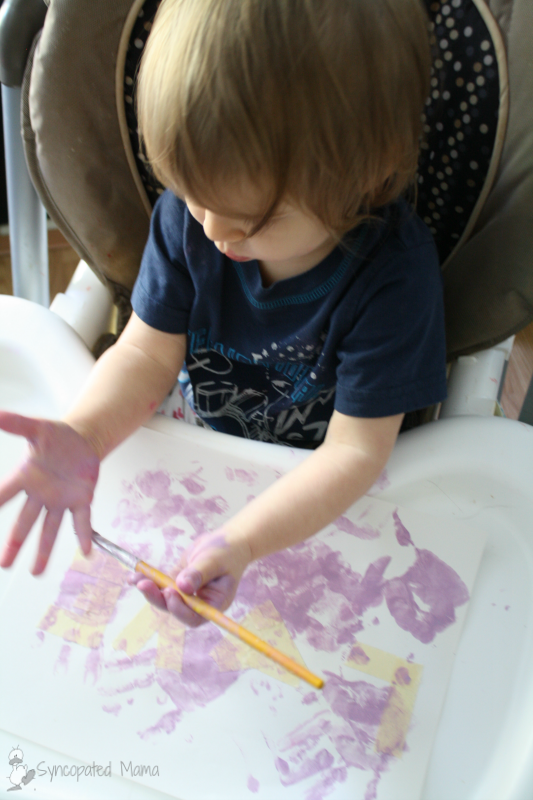 That's partly because of the length of her attention span, and partly because I needed that much preparation time in order to be able to face the prospect of paint in the hands of a toddler. Our second project involved markers. Sure, markers are messy. They end up somewhat on the paper, but mostly all over the legs and arms (and face) of your child, but it all washes off so easily, I'm not too intimidated. I also throw down our fabulous shower curtain liner as a drop cloth, so marker never ends up anywhere else it's not supposed to. I guess if you have a "runner," then things might not be so simple. I've taught Gv to set markers and pens down if she's leaving the footprint of the shower curtain liner so we don't have any issues. 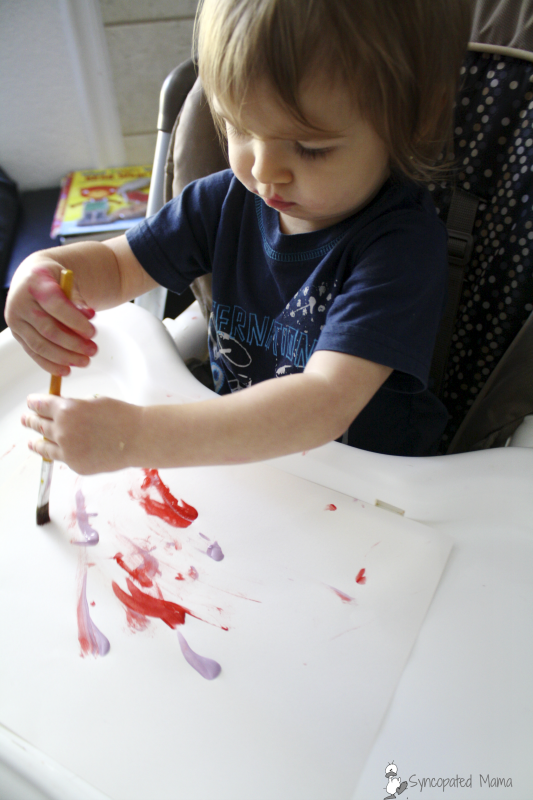 I have to say, I think always putting the large swatch of plastic down on the floor when we're doing something artsy helps her to understand and defines the limits of where the art "happens" in our house. You might want to limit the colors used for this to just Valentine's colors. I didn't think of that until later, but I ended up happy with her complete freedom with the marker box, because I really liked the end result. 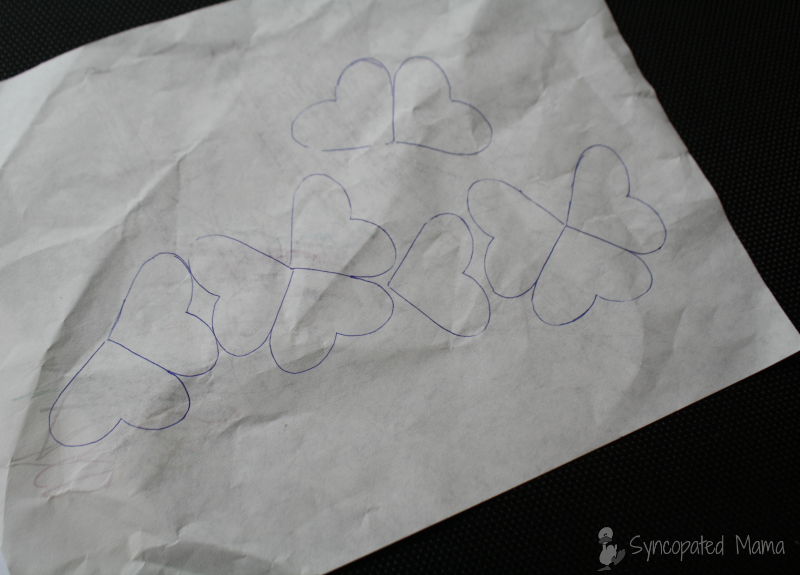 Finally, pair up the hearts to create your butterfly wings. 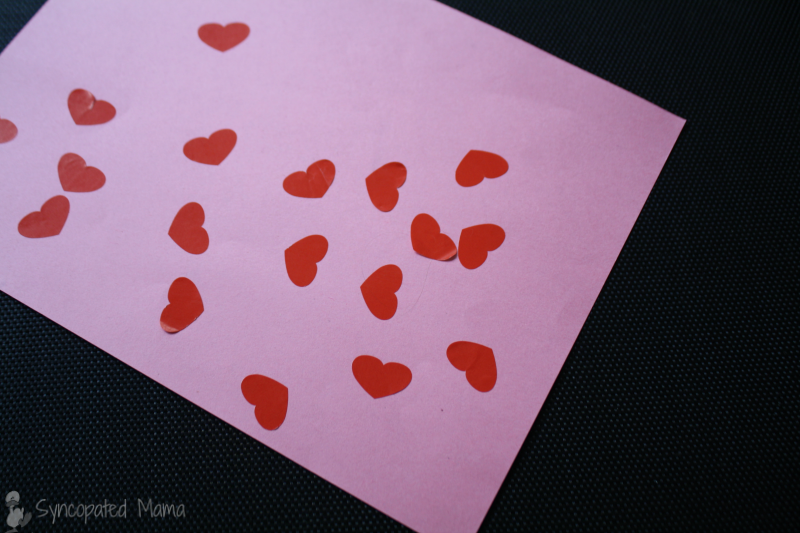 You could easily turn this idea into a card, but we just made a poster on a full sheet of pink construction paper. We're still using the paper that I'd had in my classroom craft stash, but when it runs out, I'm excited to get some of this Crayola construction paper, since it has such bright, vivid colors. I set the "wings" down on the paper at different angles and then cut little snips of red construction paper (I just cut up the edge of a piece we were using next) for the butterfly body. I wasn't even in the mood to mess with glue this day, so I just rolled up a small piece of tape, put it on the back of the body, and then stuck that down over the tips of the overlapping wings. 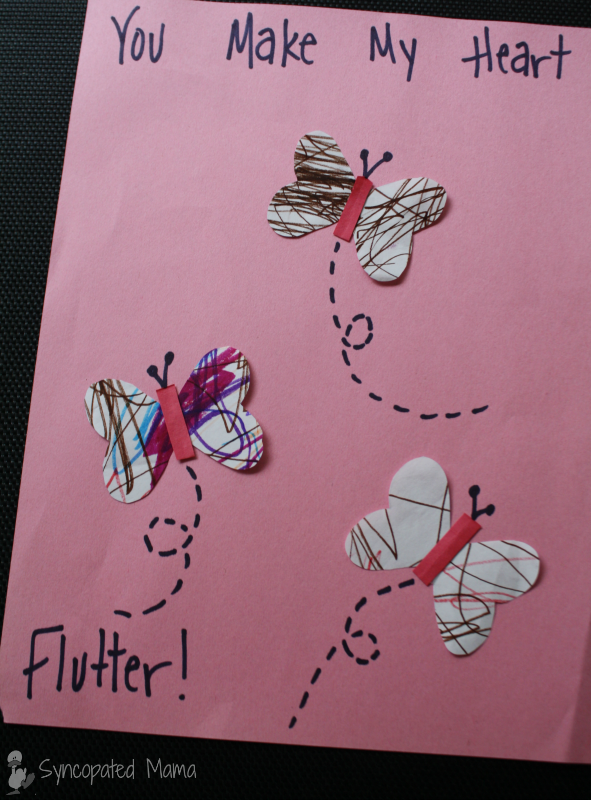 I added the antennae and the flight paths, along with the phrase "You Make My Heart Flutter!" I just adore how this one turned out. We've got it hanging on the mantle and it makes me smile each time I see it. 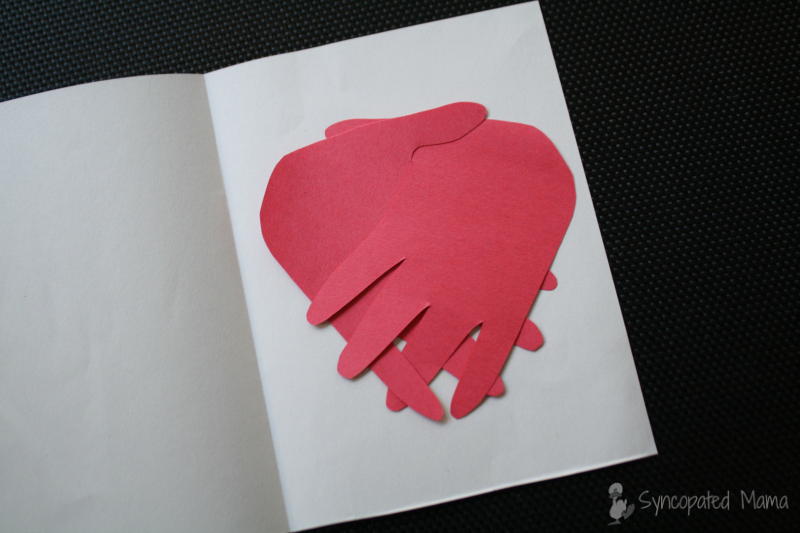 I couldn't resist sneaking one hand cutout craft into the mix and this just turned out so neat! I will say that it was a little tricky getting Gv to line her hand up correctly along the folded edge of the paper. 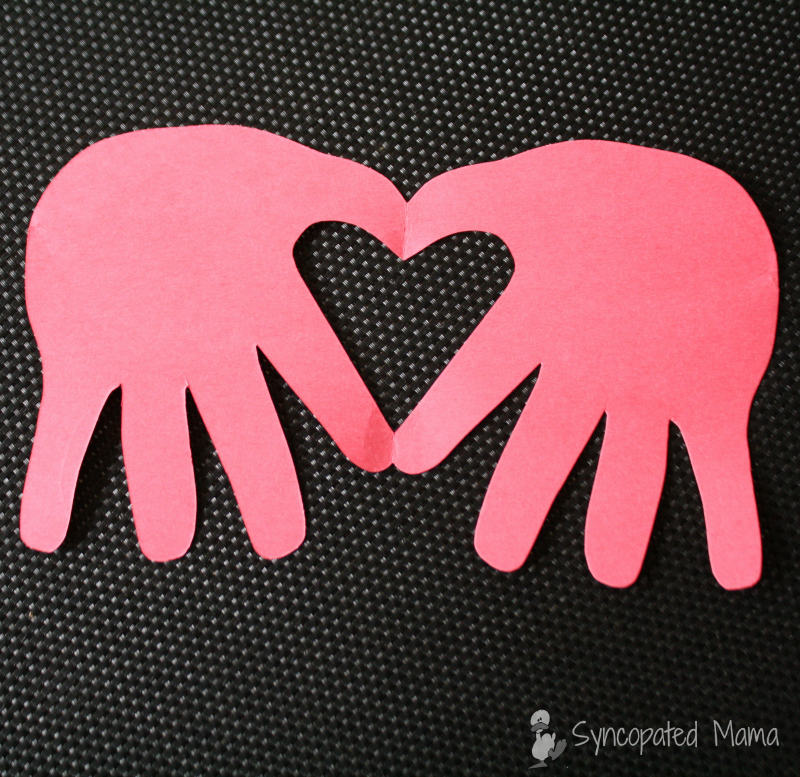 In the past, I've just been cutting out single hands, so the placement hasn't mattered. 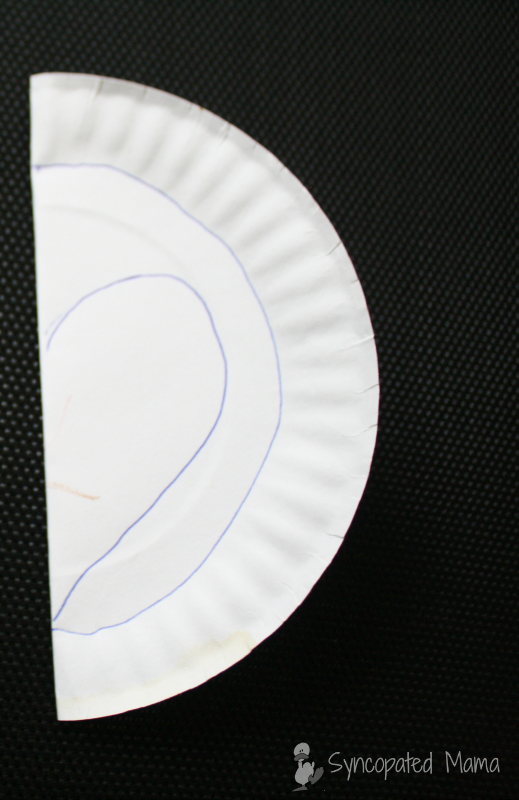 For this to work, though, you'll need to fold your paper in half and have your child place his or her thumb and forefinger right up next to the crease. Also, the thumb needs to be curved a bit. I didn't get Gv's curved enough the first time, so we needed a do‐over, which turned out okay because I was able to find a use for those hand cutouts at a later point. 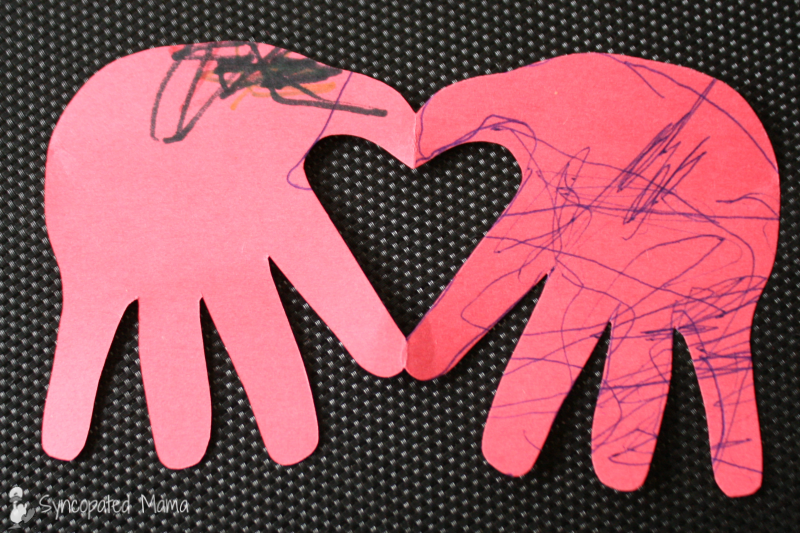 Initially, I let Gv color the paper so that the hands would be decorated. However, when it was time for me to hang this project up, I decided I liked the look of the clean hands better ‐ which do you prefer? A new day, a new start with the art. Like yesterday, I wanted something a little easier and more independent for Gv to work on right away because I once again waited until the last minute to gather supplies. I still hadn't thought to limit her color choices to pinks, reds and purples, but again, I was glad in the end. I put this in a window next to the front door. Gv shouts out "heart!" whenever she walks by and I really like how the light shines through the part that's cut out. I think this might have been my favorite process out of all the others. 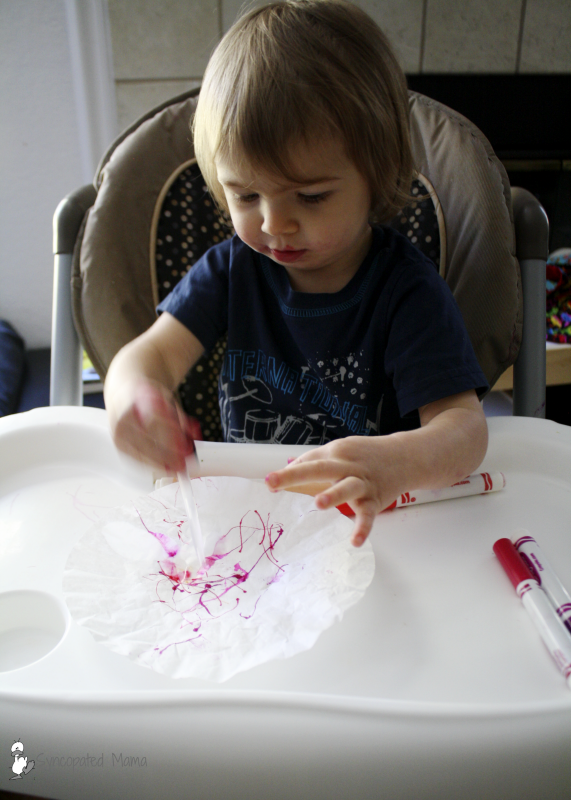 Gv really enjoyed playing with the eyedropper and water and it wasn't too messy, since I used just a little cup for the water. I first gave Gv a coffee filter and some markers (I finally remembered to just give her just the Valentine‐type colors!) and let her go to town drawing all over the filter. She really got a kick out of watching the marker colors run when the water dripped onto the filter! 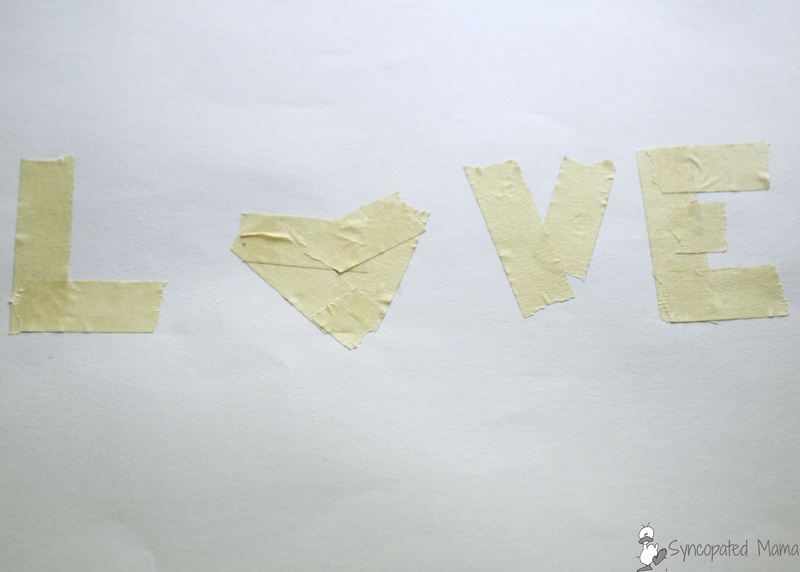 Then I squeezed out some glue onto the center of a sheet of white construction paper in the shape of a heart (filling in the center a bit). 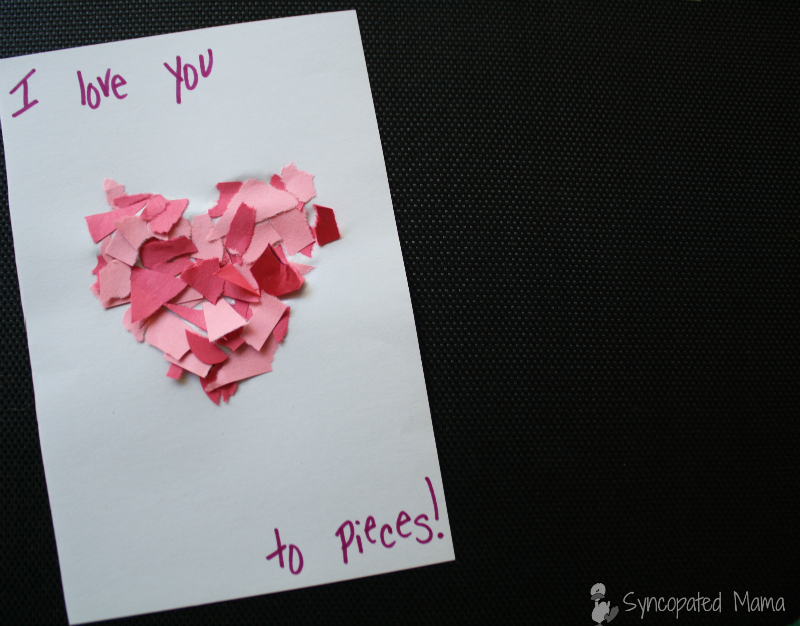 I let Gv dump the red and pink pieces onto the glue heart, lifted the paper to make all the stray bits fall off, and then sprinkled these extra scraps over the spots of glue I could still see peeking through. Have you noticed that I still haven't gotten the paint out yet? Well, hey, I had gotten out some water...and glue...and this next project would use a stamp pad. I came to the conclusion that this project is probably a bit too advanced for a toddler (or at least one on the younger side), but I definitely plan to try it again when she's older. "I hold your heart in my hands" is the phrase I've been batting around for this, do you have any other ideas? This is another project that will work better next year, when Gv's just a little older, but I'm glad we went ahead and tried it this year, because she enjoyed the process so much. 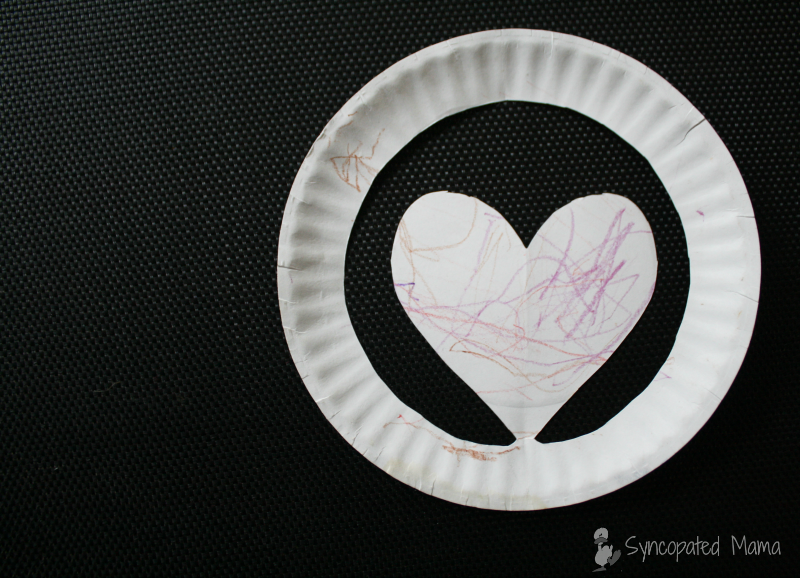 Start by taking an empty toilet paper roll and bending it into a heart shape. 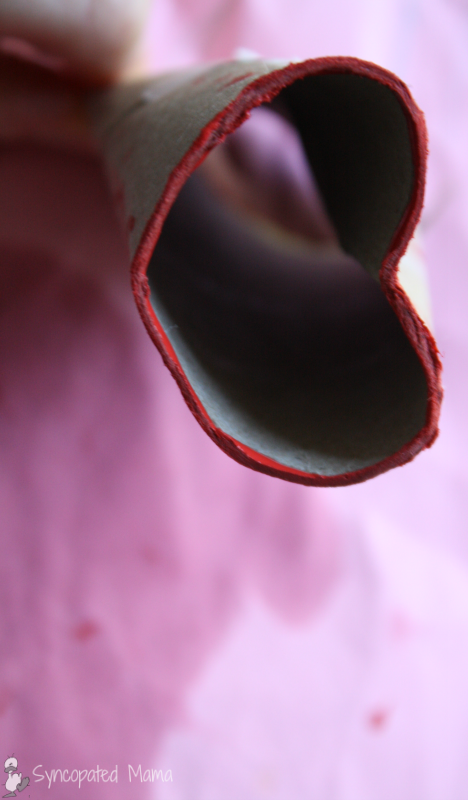 Stick a piece of tape across the "humps" of the heart to help it hold its shape. 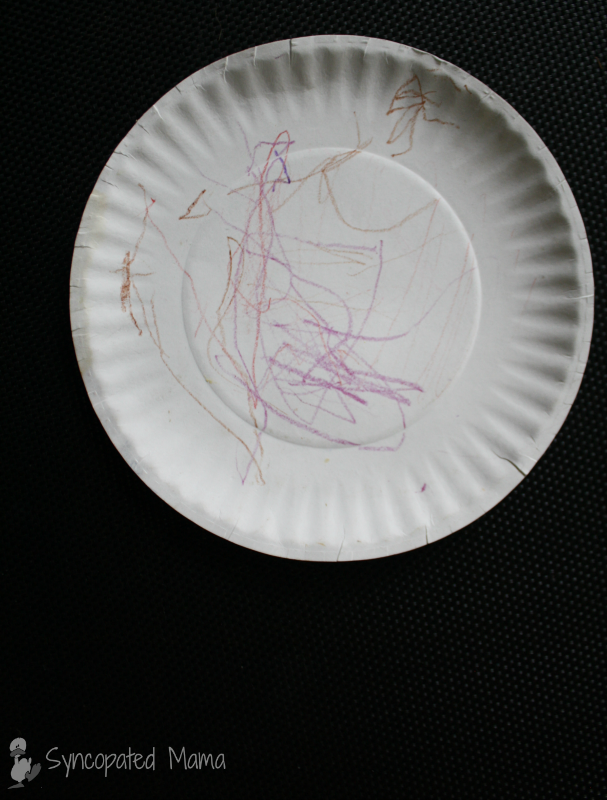 I originally planned to let Gv finger paint this project, but since she really wasn't interested in using her fingers, I decided to let her use a brush. So I'd saved the messiest painting project for last and had to laugh when it was all over, because you know what? The paint wasn't really that bad to deal with. Pretty much the same cleanup as markers and so I've decided not to shy away from painting projects again in the future. 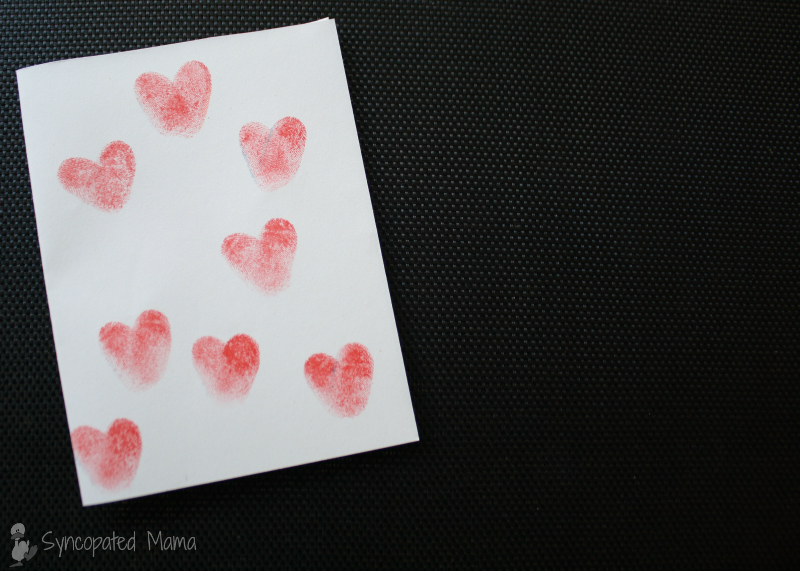 I started to name this craft "Negative Love Hand Prints," but realized that wouldn't sound too lovely. 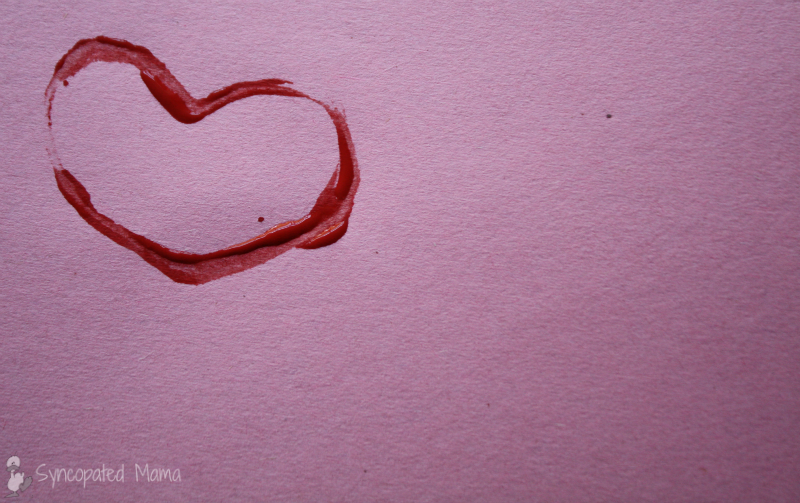 The word love will, however, be created by a negative painting technique. 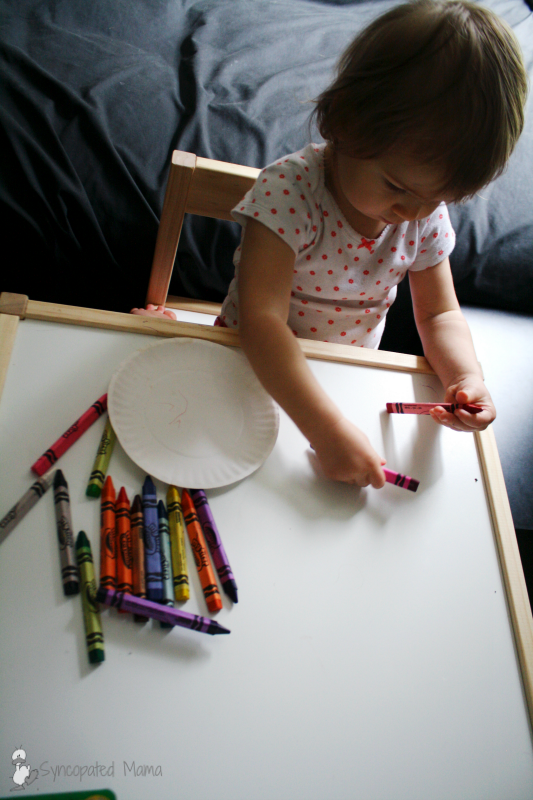 Next, paint your child's hands and show them how to press them all over the page. 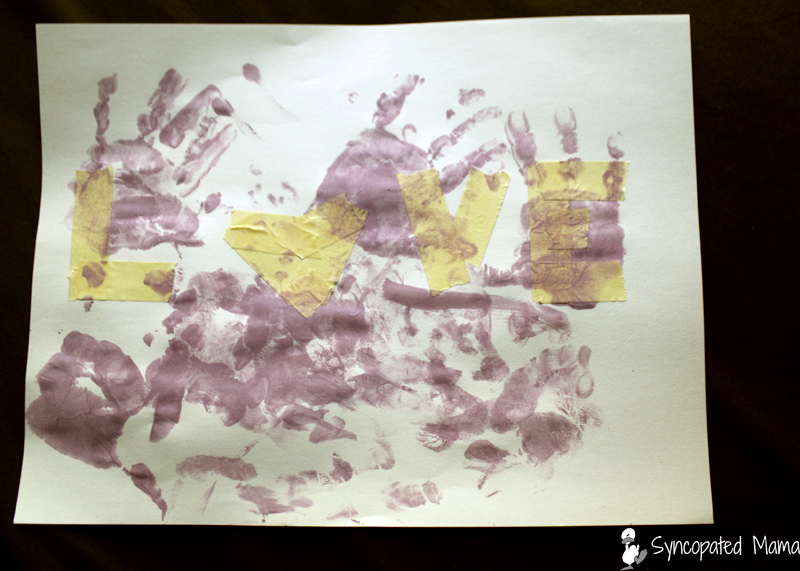 After the first round of this, Gv wanted to paint her own hands ‐ and are you ready for this? I let her! 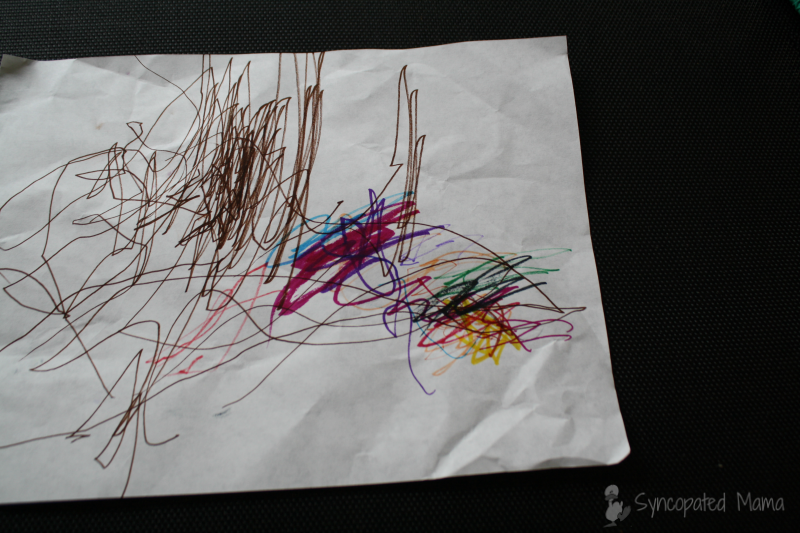 Encourage your child to really cover the page fully. 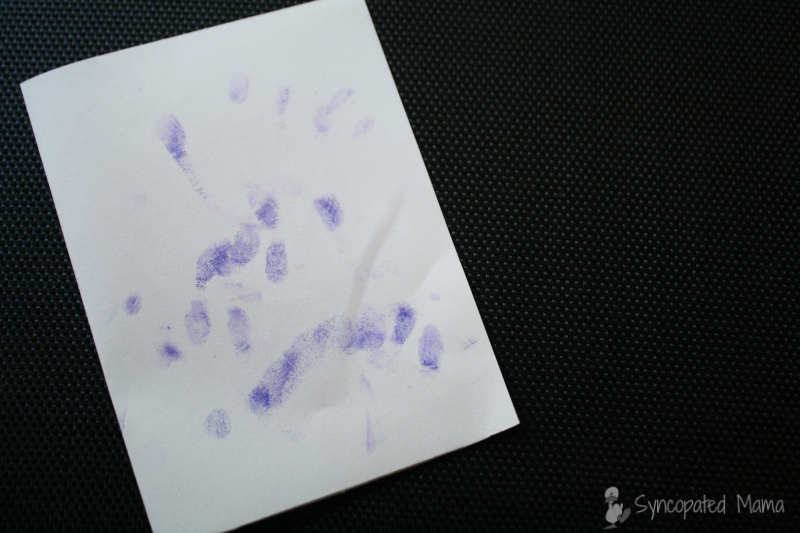 Once again, I think Gv was just a tad too young to do this really effectively, but I'm sure by next year, she'll have no problem adding more hand prints to the page. 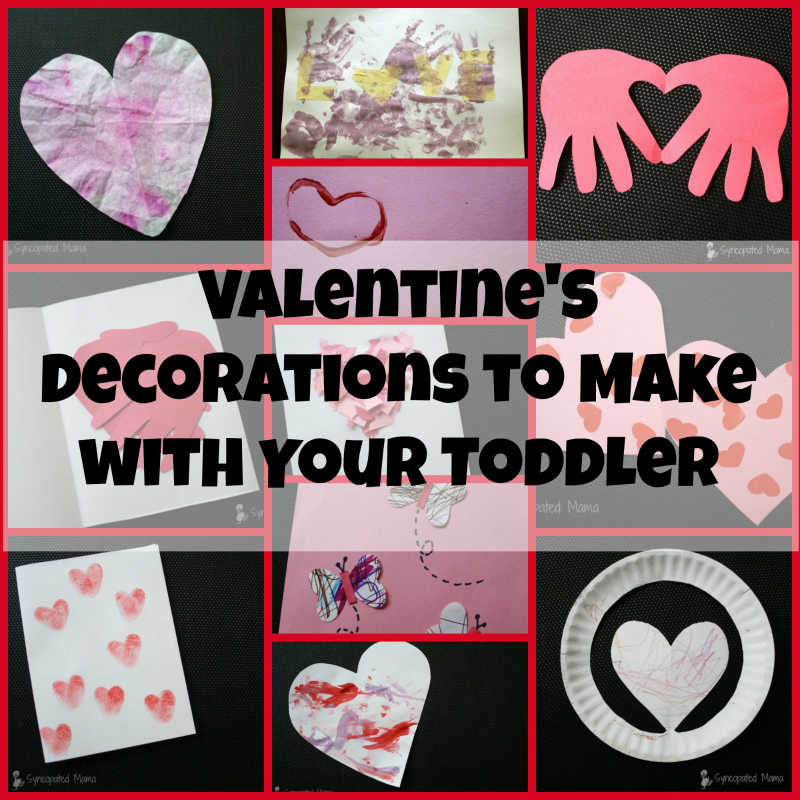 So there you have it, a whole passel of fun Valentine's decorations to make with your little sweetheart this year. I hope you and your little cupid have fun trying them out yourselves! 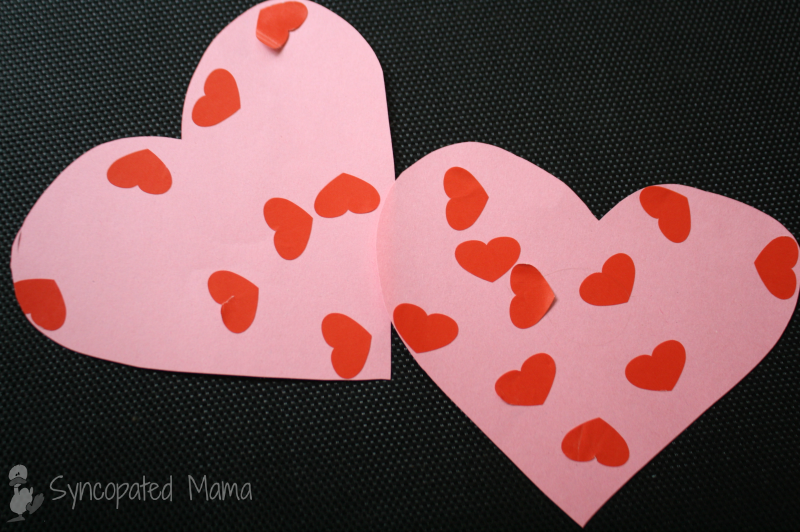 Do you have any other Valentine's Day crafts or decorations that you've enjoyed creating with your toddler? I'd love to hear - leave a comment or email me at lisahealy (at) outlook (dot) com.